Question: I have a question about wedding cake baking pans. What size pans do I need to make a cake for 150 people? Do I need to use a heating core for a 14 or 12 inch pans? And also, do you use cake mixes or make your cakes from scratch? I am not opposed to using a mix if necessary especially when you have a lot of wedding cakes in one weekend and you are going solo. You can make up for it with a really awesome filling and a great wedding cake frosting. Since I take a limited amount of orders at this point in my career, I always do scratch cakes. For each of these tiers, do you make each layer double deckers? That is two stacked cakes of the same size with filling between the layers, or would you bake only one pan of each size? Yes each cake is a two layer cake (double decker)with a filling. You can do three or four layers by splitting the cakes and making thinner cake layers etc. But I find it to be risky with a wedding cake. Can you explain the process of "lining your cake pans with parchment paper". I usually grease and flour my pans but I often see bakers peeling parchment off the bottoms of their layers after baking. What about the sides of the pans. Can I use a non stick spray for the sides and line the bottoms, and do I spray the bottom before placing the paper so it will stay? Any help would be great. Hi Traci, here is a video that I made that shows how I prepare the pans. I use Crisco but you can use a spray if you prefer it. You can also use waxed paper instead of parchment paper. First you grease the pans on the bottom and sides, then you dust them with flour and finally put the parchment on the bottom only. Its an extra precaution to make sure that your cakes come out clean and easy. 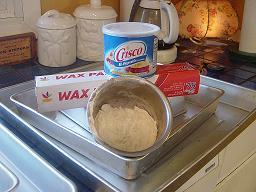 If I for some reason do not have waxed or parchment paper in stock I will grease them extra well and flour them only. But I feel more secure knowing the paper is there for good measure. Hope that helps. Perfect. Clearly explained, loved the video. Thanks for answering my question so quickly. 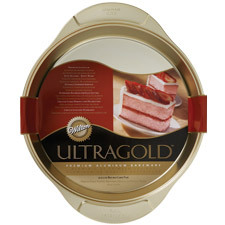 Question:I recently purchased the Gold Wilton cake pans (8 in) and was pleased with the fact my cake was even across the top, but was VERY disappointed with the sides of the cake (they were angled) and made me unhappy with the stacking of my cake! What brand cake pans do you use/suggest? They have straight sides, which would solve your problem. But having said that the cakes don't always come out perfect no matter what pan you use. I sometimes have to do some trimming, which you can do with your cakes if the sides are not perfectly straight. Just get the cakes cold first beforehand and use a very sharp knife. You can also use the 2 inch high Wilton Cake Pans. I use them both. Hi Lorelie! I found on your site the tips for the amount of batter that I need for my pan but it's pans of 2'' deep. And I have bought 3'' deep. What is the difference? Can you help me for the conversion and can you tell if the 2'' is better than 3'' ? Hi Karine, I do prefer the 2 inch pans because the cakes will bake up nicer. The deeper pans tend to get overfilled and end up over baking in some cases. Having said that I do have some 3 inch deep pans which I bought years ago thinking I could save time by baking the layers thicker, but they do not bake up as well and tend to get over baked. Fill them the same as you would a 2 inch pan or slightly more if you want to experiment with it a little. Or better yet, take them back and get the 2 inchers if you can. Yes you will need to bake two 2 inch layers and then put them together with a filling to make one 2 layered cake. Ok so I'll fill it as if it was a 2''deep. I'll put the batter in 1 / 3 pan instead of putting a half. The next mold I'll buy 2''. Because I saw a model of cake on the Wilton guides and I had to make a''6X3, 10X4 and 14x4''. ''So I guess I should cook the layers 2 times? Hi Raine, As long as you are satisfied with the taste and texture and you didn't have to take too much off around the edges then I would not make more. 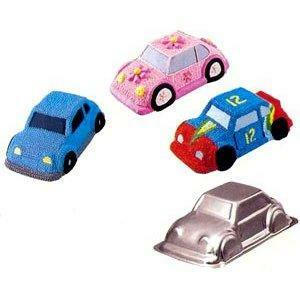 I am making a sponge cake with a 3D car shaped cake tin. What is the best recipe and also what temperature and length of time do I cook it for as it is an uneven shaped tin. I will be using fondant icing to cover it, so would a Victoria or Madeira cake recipe be better? Hi Mandy, Thanks for visiting and asking a great question. I think a Madeira cake would be perfect but don't limit yourself to just that cake recipe. All of the wedding cake recipes on this site would lend themselves to a 3D shape cake. As long as you get the cake chilled before decorating. For the baking process, bake at 325 -350 depending on your oven. Just check it after the first 25 minutes or so, and every 5 minutes after that. When the center springs back it is done. Let it cool completely before removing it from the pan. Make sure you grease the 3D shape cake pan very well with a good coating of Crisco and then a dusting of flour to make sure the cake does not stick. I have been baking for a long time now but just recently have been asked to make them for birthdays. I am thinking of trying to earn a living from it. My question is what size cake tins should I invest in? I also need a standard birthday cake recipe that I can use for all? Hi, The most common sizes that people order, at least from me are 6 inch round, 8 inch round and 10 inch rounds. A 12 inch and a 1/2 sheet pan would be good to have too. I have some really good and reliable recipes on this site that I have been using or years. The chocolate cake recipe is my all time favorite and can be made with a variety of fillings and frostings. The white cake recipe can be varied by replacing the milk in the recipe with orange juice and zest to make a wonderful buttery orange cake. The carrot cake recipe is so good that even people who don't like carrot cake like this one. What do you use to put the correct amount of batter in the pan? I am either putting too much or not enough. My cakes are coming out thin on one side. Help!!!!!!!!!! Hi Pam, Here is a pan volume and servings chart for round, square, sheet and cupcakes. Use a measuring cup and the suggested amounts on the chart. If your cakes are coming out lopsided then your oven may not be flush. You may have to turn your cakes every 15 minutes or so to even them out. When making cakes with Wilton deep pans do fillings need to be made? Can tiers be made with one deep pan at a time...vs having to make two cakes level and fill? If filling deep cakes can the bottom level be crumb and top crust? 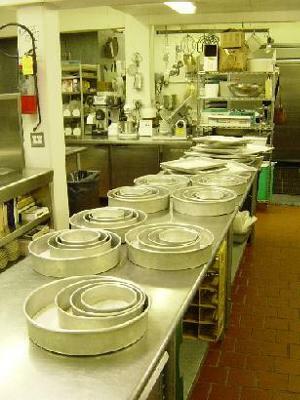 I much prefer the 2" deep Wilton Pans, pictured above, over the 3" deep pans. With the 2 inch pans you make two separate layers. The idea of making the entire cake in one deeper pan is nice but the cakes tend to be dense and not bake properly. I am assuming you have the 3 inch deep pans. You can still use them to bake a shorter layer. I own both kinds and use them all the time to make a single layer. But if you do decide to bake your cakes in the the deeper pan then you will want to split them and make a filling for in between. I am not clear about your second question. Can you respond back and clarify please? Here is a link to Baking Pans Questions and Answers on this website that may be useful to you. Thanks for visiting and asking a great question.